Where has this year gone? Looking back at the year gone it seems such a blur. When I began the year I was unsure of what I wanted to inquire into as part of my professional teacher development. So I began the year by focusing on establishing a digital tool, Steps to Success, that students could use to self assess their writing and therefore make improvements. I then moved the focus of this digital tool into Mathematics to guide students to use numerous strategies when problem solving. 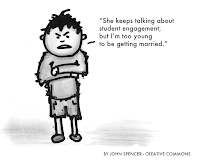 Within both of these areas it was difficult to get students to engage with the tool due to their lack of engagement and ultimately their low key competencies levels. While I was inquiring into these areas the whole staff actually had a professional development focus around vocabulary and reading. Therefore my professional teacher inquiry began to focus on my reading instruction and specifically the teaching of vocabulary. So as I look back at the year I recognise now that I actually put more attention into inquiring into reading without realising and documenting. Now that I am at the end of the year I have reflected on the year past by documenting my reading inquiry and what my goals will be for next year as I will continue to develop and inquire into my reading teaching practice. I hope as you read this or have followed my blog over the year that my inquiry may have proven valuable for your own teaching development and practice. This is an update and reflection on my inquiry journey over the past term. The two key points this term have been around motivation and engagement. Term 2 Reflection on my personal inquiry. This term my inquiry took a big change from being focused within Writing to now within Maths. I introduced a number of new learning methods which my students quickly took on board. These methods are to give my students the opportunities to develop their strategies for problem solving. These strategies are what they are then able to track their progress with and use to decide what their next learning step is. Here is a presentation that I presented to a group of teachers as an update on my Term 2 journey. Developing a dialogic, orally expressive classroom. This term as part of our personal inquiries we have the privilege of having a number of professional development sessions. This week we had Dr Jannie van Hees present on how to develop a dialogic, orally expressive classroom. In Jannie's presentation there were a number of points where I was challenged to reflect on my practice. She began by asking us two questions. How do you encourage and promote oral language and dialogic teaching? And how do you explicitly grow your student's expression? When reflecting on these questions I found it hard to pinpoint when during the day do I actually explicitly teach and promote oral language. During the day I am continually in conversation with my students but there are not many times when I am deliberately teaching and enabling oral language. Every week when I take literacy reading groups I have 10-20min with a small group of students. During this time we read our text and discuss it with preprepared questions. I am often encouraging students to share and explain their thinking because I am interested in their ideas rather than focused on developing their expression. These times would be perfect opportunities to teach, model and encourage further dialogic expression. Another major point that I took away from this presentation was the need to gift students with language and vocabulary. Unfortunately many of my students have not had vocabulary and language rich childhoods. Of which this means many of them have limited vocabulary and more importantly limited ability to process and express language. Students need to have this ability to express language because language makes meaning. Meaning is foundational to developing, interacting and communicating fluently in this world. Jannie challenged us with the point that if we continually question students and aren't gifting them new language then they can and will only ever recycle that which they already know. We need to deliberately input language into our students otherwise there will be no increase. Once we gift students language then their brains can be pushed and their expression can grow. As practical application from this discussion there are a couple activities that I want to incorporate within my daily classroom practise. Provide extended texts, talk and videos to students to gift them vocabulary. Then to establish this vocabulary and challenge their brains get them hold, discuss and retell the information. Before completing a piece of writing get students to sort the information in their head, retain their whole story and share to their peers or back as a whole class. Have a word of the day where as a class we explore a new word and challenge ourselves to use it throughout the day/week. This term we have been wanting to introduce a new positive behaviour system into our big learning space. So after some thought and a days work this is my next big idea. Throughout the day students will be rewarded for positive behaviours and focused learning. Each rewarded student will have their name written onto the Wheel of Fortune. 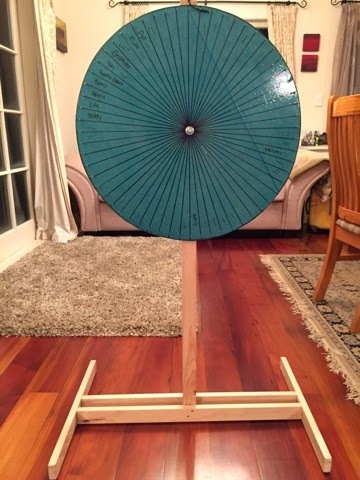 Once the wheel is full of names the wheel will be spun and the lucky student(s) will be rewarded. After this all the names will simply be rubbed off and another round will begin. Over the past couple of weeks I have been trying to develop an chart that will enable students to identify where they are and what they need to do to achieve a higher standard. To begin my inquiry I have focused on writing and specifically punctuation. 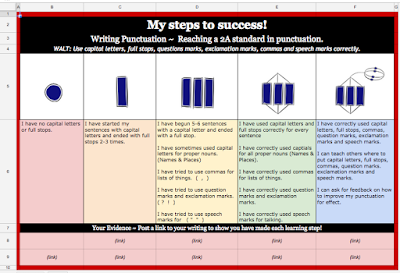 Before getting to my final chart I went through a number of steps to ensure that they would be accurate and also work well digitally on student blogs. Chart 1: I inserted progressions into spreadsheets but these were too broad to be effective. Chart 2: I took on specific writing progression and using SOLO made a chart which students could identify themselves on and see their next step. The downfall with this chart was when embedding a Google Spreadsheet into a blog the size adjustments are not very smooth and it is too difficult for students to do it themselves. Chart 3: Using the same information as the previous chart I make this chart in Google Presentations. This worked much better because the process of embedding a presentation into a blog is easier and students can easily adjust the size to fit the layout of their blog nicely. 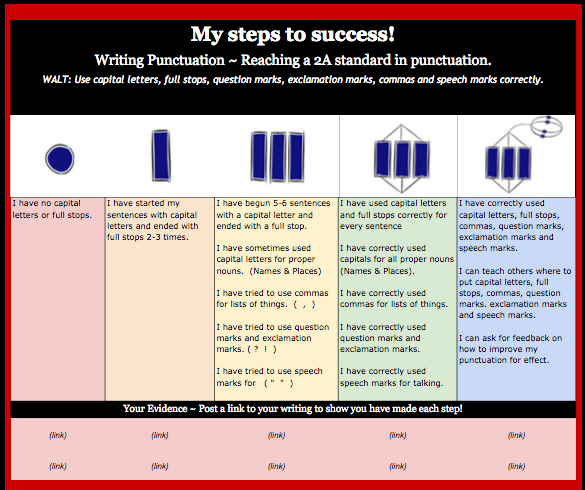 The bonus of this chart being embedded into the blog means that student can add links to pieces of writing as evidence and they don't need to update their blog because it updates automatically. Also another bonus is that these links work when embedded on their blog so any viewer of their blog to click on and see their writing evidence. Chart 4: After presenting this chart and working through it with a number of students I quickly discovered that I needed to make each step very clear and give more detail. For example I needed to state how many sentences a couple is. So my final process has been to amend each steps and this is the final chart of which I am using with my students at this stage. How can students being aware of what they are learning and what they need to learn to accelerate cognitive engagement? Over the past few weeks I have put much thought into how I could physically carry this out. Initially my plan was to use progressions with each student to identify what level they are working at. Then to make these progressions visible to the students so that they can see what is expected at the next level. But, I have faced a number of problems with this initial plan. Firstly our school progressions are very broad and are not worded in such a way for students to understand and identify achievement clearly. Secondly because the progressions are per year, the progress of a student is going to be very minimal. Therefore, such a goal could potentially be too hard and take too long to give students any sense of achievement and motivation. So this has left me with the need to have small achievable learning steps for each specific learning intention/WALT. The new direction which I have now taken to try satisfy this need is to use SOLO Taxonomy. In a recent meeting as a whole staff we explored SOLO and how it provides a model of understanding with several steps. From previous experience I value how SOLO breaks down learning intentions to give the learner explicit steps of their understanding. Therefore students are able to answer these three questions. What am I learning? How is my learning going? What do I need to learn next? As a result of this new direction with SOLO my original goals are the same but instead of using progressions directly I will break down each progression with SOLO to create achievable and visible learning steps.